We are lucky that each day we get the opportunity to come across so many diverse and exciting creatives, everyone has their own story to tell and a fresh perspective to share with the world. I’d like to introduce you all to a sculptor today who’s progressive persona really struck a chord with me, her name is Dimpy and she’s based in Bangalore, the capital of the Indian state of Karnataka. A passionate drawer from a young age Dimpy was introduced to the medium of Bronze sculpture by her art teacher. Although she was encouraged by others to focus on painting alone she felt this was a style of creating she could really connect with, since blossoming into an established artist in the material. What I really loved about this film was seeing Dimpy’s passion and enthusiasm for what she’s making, it’s rather infectious and instantly brought a smile to my face. Her attitude is really refreshing as she only wishes to create projects that convey a positive perspective of the world around her. Occasionally her works delve into a surreal outlook but she never alters her approach with regards to the reaction she wants to provoke from her audience. 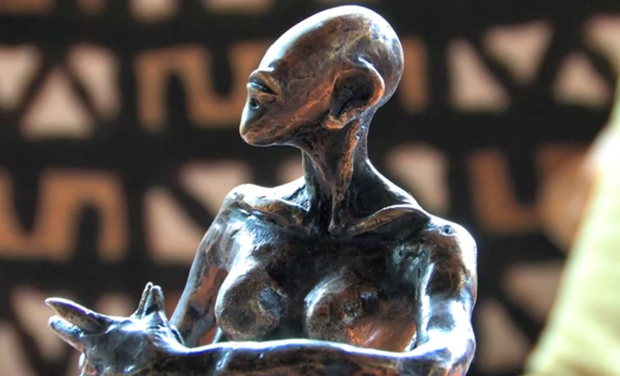 In essence her artworks are just an extension of her own spirt and energy eternalised in bronze. Big inspirations for Dimpy include athleticism and movement used to symbolically represent the resilience of human kind. She believes that the human form is at the pinnacle of all creation and strives to find what she describes within this as the perfectly balanced form. She has transformed these ideals into her works both small and large, one of my favourite pieces we get to see below is the final one to be shown, a life sized figure encased around water. I’m sure you will all have your own favourites and opinions so go take a watch and see what you think for yourself, I hope her work has the same uplifting appeal as it did for me. Enjoy!